Guiding people to move with a greater sense of comfort, joy, ease and freedom. I teach yoga-based movement practices because I want to share my knowledge and enthusiasm for how movement helps us feel better. I began my formal study of movement in 1997 during my quest to find a way to ease pain associated with scoliosis. I quickly discovered that conscious focused movement not only helped ease my pain, but was great training for my mind and inspirational for my spirit. This discovery led me to explore many movement modalities with yoga as a central focus. 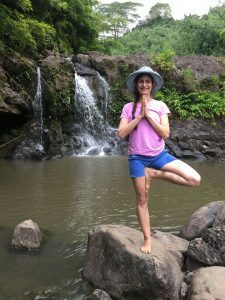 I teach and practice with a whole-body approach to movement where the connections of mind, body and spirit are paramount. I apply biomechanical and neurological understandings of the body-mind connection to teach in a way that is accessible and challenging. While my teaching manner tends towards the playful, I am very serious about teaching careful alignment and physical safety. My ultimate goal is to guide and support people to move and therefore live with a greater sense of comfort, ease, joy and freedom. I think yoga-based movement is a particularly powerful practice because it helps one take an active role in taking care of oneself. As we live in and with our bodies every moment of our lives—not only while we are exercising—I believe it is vital to apply the insights gained during a practice session to everyday habits of movement. As an anthropologist, I am keenly aware of how the culture we live in literally shapes our bodies, affects our body image and frames our experience of living in and with our bodies. I graduated from the Piedmont Yoga Studio’s Advanced Studies 650+ hour program in 2001 and studied in Pune with the Iyengars. I am certified by Elise Miller as a Yoga for Scoliosis Trainer, have trained in Schroth methodologies and completed Adaptive Yoga Training with MindBody Solutions. I hold a teacher certification in Yoga and Jewish Spirituality from the Institute of Jewish Spirituality. I am R, I, S & T certified in Z-Health neurological based fitness and am currently in the process of being certified by Katy Bowman as a Nutritious Movement practitioner. I also hold an MA in Anthropology from Stanford University and serve as a Spiritual Leader at Kehilla Community Synagogue. In this capacity I officiate Jewish life-cycle ceremonies. I also enjoy facilitating non-sectarian weddings. I believe that being a student is essential to being a good teacher. I am grateful for my many teachers including Elise Miller, Donald Moyer, Mary Paffard, Richard Rosen, JinSung, Matthew Sanford, Katy Bowman, Dr. Eric Cobb and for my students from whom I continue to learn a tremendous amount. You can find my teaching schedule here. If you would like to do a private session via Skype or FaceTime contact me here.